This print dates back to the Alternate Graphics era of Shepard's career. It was hand-pulled and hand-numbered by Shepard. The graphic was also used as a t-shirt design. 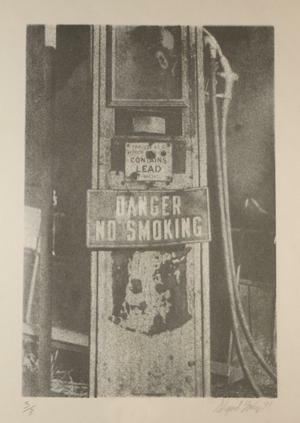 As per Jason Filipow: "The story on this filling pump print is that-and I am recalling a conversation with Shepard from 91 or 92 here-he shot the photo himself; I believe as part of a photo class he was taking at the time. The thing that caught his eye was the decay and rust on the face of the gas pump, particularly under the 'Danger No Smoking' signage, was that the rust 'pattern' looked like a profile of a skull.....now one could make the argument that the artist was seeing (and focusing upon) this element of layered decay, etc. would inform his later fine art to a large degree."